As you can guess psoriasis facts and statistics do not offer much consolation to a psoriasis sufferer. The main statistic we hear most is the prevalence of psoriasis in the world stands at around 2-3% of the world’s population. Therefore, this post will be different from your usual psoriasis statistics post such that it lists the results of the Smart Psoriasis Diet Community survey which focuses on how diet and stress management can help reduce, improve or control your psoriasis. The survey was sent out to the Smart Psoriasis Diet community. Please note that 1 person answered scalp psoriasis but I assigned that to plaque psoriasis. It is clear to see that plague, guttate and inverse psoriasis are the most common forms of psoriasis among our community. As you can see from the results from our survey, over 55% of psoriasis sufferers who got tested for Vitamin D were deficient. Key focus area number one in the Smart Psoriasis Diet Plan is getting adequate sunshine or Vitamin D3 supplementation. It is by far the easiest step of all the three key focus areas. I was surprised to see that 71% still had not got tested for this. Come on people, please go to your doctor to have it tested or at least try a vitamin d3 home test kit. If you have tried an anti-inflammatory type diet before (either the Smart Psoriasis Diet Plan, John Pagano, Paleo or any diet that is high in natural fibre with no processed foods/refined sugars/alcohol etc), have you seen an improvement in your psoriasis? 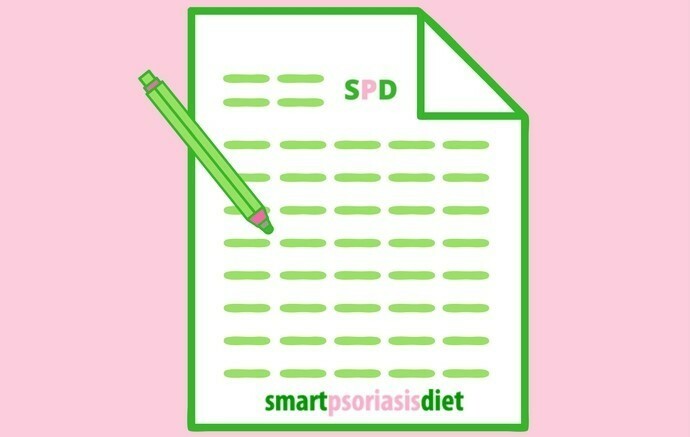 A psoriasis friendly diet is key focus area number two in the SPD plan, and our survey backs up how important it is. 65% of respondents state their psoriasis improves when eating a healthy diet. You can read some psoriasis diet success stories or check out the good foods to eat and foods to avoid lists. Do you notice your psoriasis getting worse when you are going through periods of prolonged stress? The third and final key focus area of the Smart Psoriasis Diet Plan is stress. We delved more into this particular result in our “Can stress cause psoriasis?” post last week so check it out as this result was the most intriguing of the lot and fits into my beating psoriasis trifecta theory perfectly. I would like to thank all of the respondents to this survey and I hope you find the information above useful. I know I did.